In the North, in the south, omo valley, and with exception of explore the hottest and most active volcano lake in this world ERTA ALE make you feel that you put your foot print on the mother land of all human being. Where Lucy and other very old hominid fossils was discovered. Arrival in Addis Abeba. Morning free. Afternoon, visit the capital, begin by the St Trinity cathedral church, then national museum home of our ancestor LUCY. Then, drive to the mountain ENTOTO to see the view of the city final visit the biggest market Markato . Morning, fly to Bahar dar. Full day, excursion boat visit the monastery of lake Tana urakidane mihret, Narga siliase found in the center of the lake in DEKE ISALAND the biggest island. Morning, drive to blue Nile falls. Then walk for 20-30miniute to visit Portuguese bridge date back to 16th century made during the king fasiledes of Gonder and the blue Nile falls, the longest river in this world. Drive back to visit the local market in Bahridar and of afternoon admire the sun set . Morning, drive to Gondar. On the way, to visit the village of AWRA AMBA. 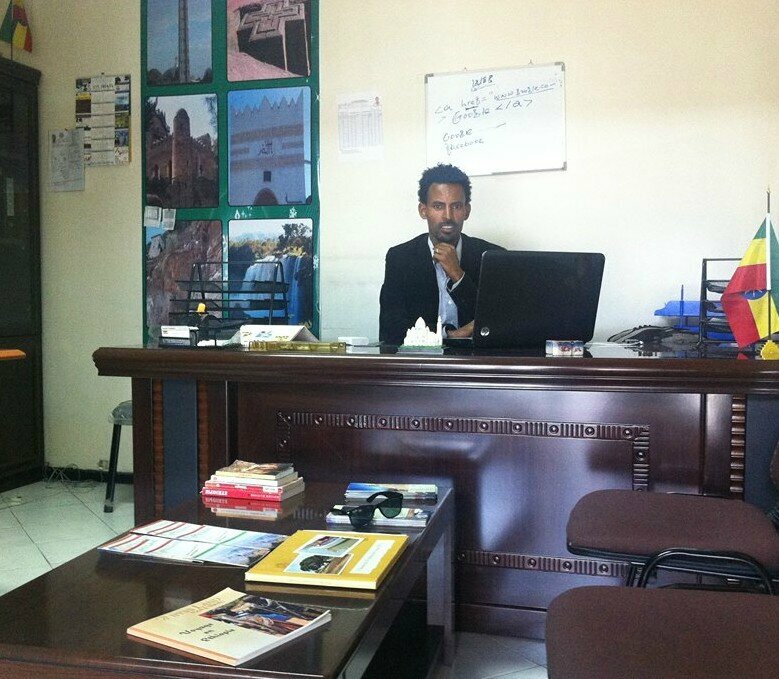 In the afternoon, visit the medieval city of Gondar . They have been classified as a UNESCO World Heritage Site. Morning, drive to Simien national park. Excursion in the park, to observe the fascination over view of this unique land scape and the bleeding heart of chilada baboon endemic to Ethiopia. They have been classified as a UNESCO World Heritage Site then drive back to Gondar. Morning, fly to AXUM. Visit the mystery city of Axum, discover the ancient civilization of Axum, the largest single stone obelisk in the world height 24m up 33m, weight up to 520 Tonnes, the kings tombs, St Tsion church and the oldest stone inscription of King EZANA in three language, geuz, greek and sabian. They have been classified as a UNESCO World Heritage Site. Early in the Morning, drive to Hamed Ela, via the Salt market and the caravan station city Berahle. Late afternoon, admire the sun set and the arrival of caravans. 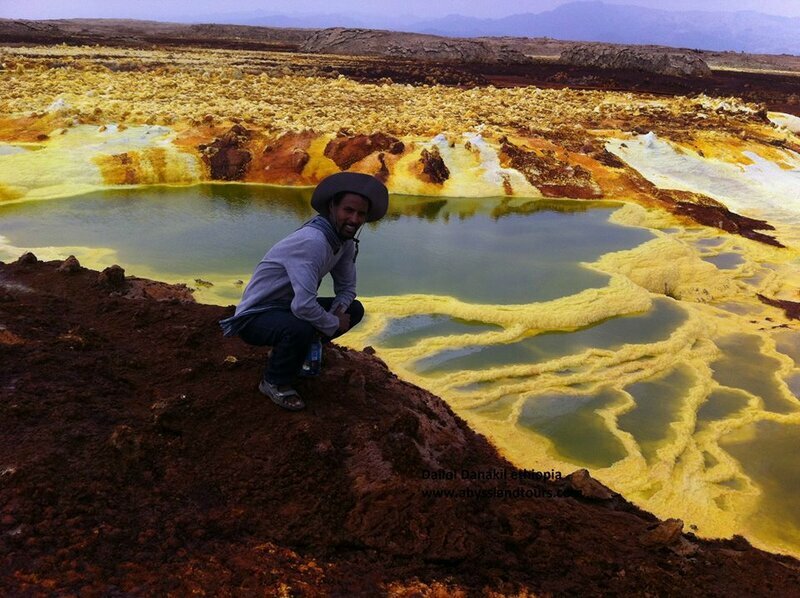 Morning, visit the magic land of DANAKIL- DALLOL and LAKE ASALE, the place where red see join inside the earth crest. Morning, drive to Dodom on the sandy and volcanic rocks. End of afternoon, trek on foot or camel back to the top of the smok mountain lava lake Erta ale, the hottest and the most active volcano in our world. Then observation of the activities of the volcano by night . Early morning, short observation of the fascinating activities of volcano then walk on foot for about 2 hours. Then drive back to Mekele via Afdera and Abergele . Morning, drive to Lalibela via the Abyssinian high land or Ethiopia plateau. 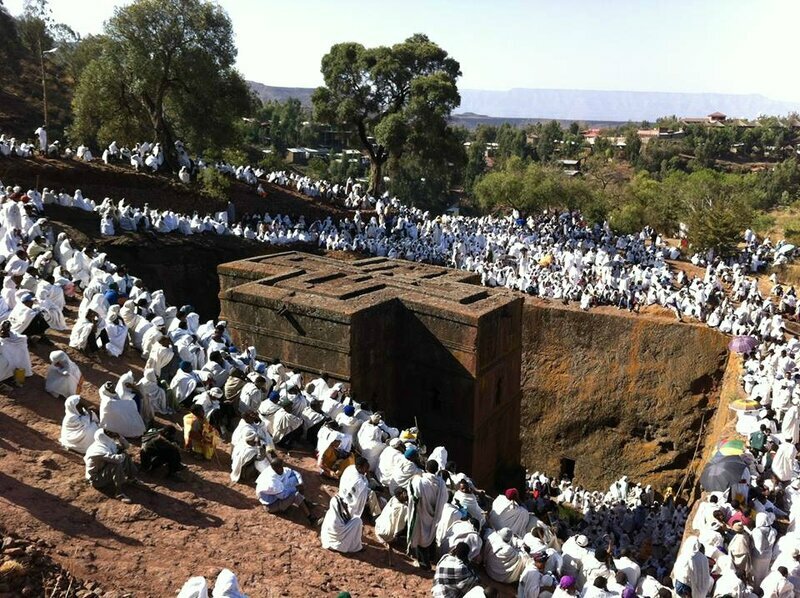 Visit one of the eighth wonders of this world, lalibela, the home of fascinating rock hew churches dated back to 12th century A.D, they have been classified as a UNESCO World Heritage Site. One of the 8th wonder of the world next to the table mountain of cape-town in South Africa. Morning, fly back to Addis Abeba. Then drive to ward south Awasa, on the way to visit the twin rift valley lake Abijata – Shalla which is now home of different aquatic birds and mammals, and the shalla lake the deepest rift valley lake in Africa . Morning, drive to Arbaminch and end of afternoon, visit the Dorze people, known for their cotton woven clothing and bamboo - made beehive shaped, they were the hunter of elephants. Morning, drive Jinka. On the way, to visit the fascinating peoples and culture of Omo Valley tribes, first visit the Konso people , who for centuries have practiced terracing and intensive agriculture in their steep land and are known for their wooden totems they erect over the graves of the dead. Afternoon, visit the king’s village, they have been classified as a UNESCO World Heritage Site. Morning, drive to Mago national park to visit the tribe group of mursi , experts at body painting-using clays and locally available vegetable pigments to trace fantastic patterns on one another's faces, chests, arms, and legs. The uniqueness of mursi men They insert a wooden and terra-cotta disks in to the ear lobes, Mursi warriors carve deep crescent incisions on their arms to represent each enemy they have killed in battle and mursi women split and stretch their lower lips to make room for similar disks but the biggest disk she has the most beautiful than others This lip-plate is also an expression of female social adulthood. A girl will have her lip pierced by her mother, or another woman of her local community, when she reaches the age of around fifteen. Scarifications, is a widespread custom in mursi. Afternoon, drive to Turmi. Morning, drive to Turmi, visit the Hammer market held on every Monday. In the market, Hammer men elaborate hairstyles and Hammer women wear their hair in dense ringlets smeared with mud and clarified butter and topped off with a head- dress featuring oblongs of gleaming aluminum, the bull jumping is one of the cultural attraction in Hammer village . Morning, drive to ward Karo, visit the village KORCHO. They live along the east banks of the Omo river like many of the tribes in the Omo, they paint their bodies and faces with white chalk to prepare for a ceremony. The chalk is mixed with yellow rock, red iron ore and charcoal to make its color. Face masks are worn at times and they have clay hair buns with feathers in them. Red clay mixed with butter is put into their hair and clothing is made from animal skin. The women scar their chest believing it makes them beautiful. Then afternoon, drive back to Arbaminch . Morning, drive back to Addis abeba, then fare well dinner in a traditional restaurant in Addis Abeba.